Digital artwork does occupy a broad space in the every day life of young people. Most obvious example: recent pop music. That way the project “remix” was founded in cooperation with the youth club Praunheim. Here, in small groups, young people easily learn the basics of digital music arrangement. 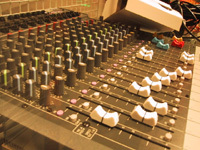 The aim of the project is to produce an own track together. Alternatively also an already existing piece of music can be remixed, and so – as the participants like it – new versions can be created. The necessary technology (mixer, sampler, sequencer) is ready in the NokiaLab. In the end the young music producers can take home their own tracks on a burned CD.